Thanks for coming to this month’s Work Party! 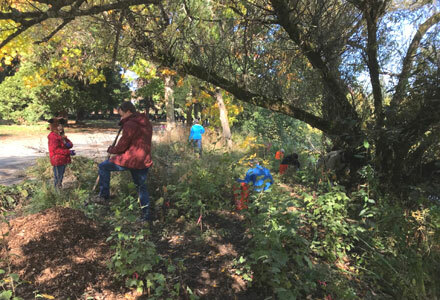 Meet: East End of the Small Craft Center Docks, 5900 W Green Lake Way N (near the old Aqua Theater and the Pitch and Putt Golf Course) We will be grubbing out invasive Himalayan Blackberry canes on the west side of the lake to open a new area for planting next fall. Wear your grubbies, long sleeves and drizzle protection. Can you make it? 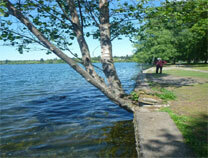 You can also find information on Green Lake Stewards Work Parties on Friends of Green Lake Calendar any time. KS provided the Treasurer’s Report, noting that to date account was $5,836.40 with a contribution of $275 from the Taiga Hinkley memorial source, as noted by KS and MH. MH commented that any work to memorialize Taiga should have a practical benefit to patrons of the park. JJ suggested a planting of a tree or similar act would be appreciated. MH suggested the webpage story about any memorial to Taiga might include a photo of him kayaking – one of his favorite activities.